NOT ALL DOOM AND GLOOM. Tesla might be sucking the life force of CEO Elon Musk, but at least the company’s got some some good news to show for it. SEEING SEMIS ON THE REG. This wasn’t the first sighting of Tesla’s Semi prototype. The vehicle has been making its way across the country, popping up in Missouri, Oklahoma, Texas, and California. During some of those stops, witnesses managed to catch a glimpse of the prototype’s charging system. Based on their reports to Electrek, the truck charges via several extension cords, each plugged into its own supercharger stall (these are the chargers used to power Tesla’s other vehicles). This should cut down on charging times, though Tesla plans to eventually create Megachargers that could power the Semis much more quickly. The reports, however, don’t detail how exactly — or who — plugged the trucks in. THE FUTURE OF TRUCKING. 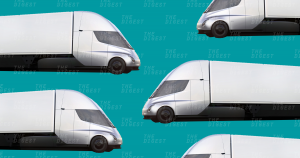 Tesla’s autonomous Semi has the potential to radically transform the future of trucking. According to reports, the vehicles will cost less to operate than their diesel counterparts, and because they’re electric, they’d be far better for the environment. Trucking is actually an industry that needs more workers, so the vehicles aren’t expected to put anyone out of a job, either. If that Tesla’s Semi prototype did in fact traverse the nation solo, we might not have much longer to wait for the autonomous revolution to hit the trucking industry.